As described on the UCSC Genome Browser website (see link below), the BED format is a concise and flexible way to represent genomic features and annotations. The BED format description supports up to 12 columns, but only the first 3 are required for the UCSC browser, the Galaxy browser and for BEDTools. BEDTools allows one to use the “BED12” format (that is, all 12 fields listed below). However, only intersectBed, coverageBed, genomeCoverageBed, and bamToBed will obey the BED12 “blocks” when computing overlaps, etc., via the “-split” option. For all other tools, the last six columns are not used for any comparisons by the BEDTools. Instead, they will use the entire span (start to end) of the BED12 entry to perform any relevant feature comparisons. The last six columns will be reported in the output of all comparisons. The file description below is modified from: http://genome.ucsc.edu/FAQ/FAQformat#format1. chrom - The name of the chromosome on which the genome feature exists. Any string can be used. For example, “chr1”, “III”, “myChrom”, “contig1112.23”. start - The zero-based starting position of the feature in the chromosome. The start position in each BED feature is therefore interpreted to be 1 greater than the start position listed in the feature. For example, start=9, end=20 is interpreted to span bases 10 through 20,inclusive. end - The one-based ending position of the feature in the chromosome. The end position in each BED feature is one-based. See example above. name - Defines the name of the BED feature. Any string can be used. For example, “LINE”, “Exon3”, “HWIEAS_0001:3:1:0:266#0/1”, or “my_Feature”. score - The UCSC definition requires that a BED score range from 0 to 1000, inclusive. However, BEDTools allows any string to be stored in this field in order to allow greater flexibility in annotation features. For example, strings allow scientific notation for p-values, mean enrichment values, etc. It should be noted that this flexibility could prevent such annotations from being correctly displayed on the UCSC browser. Any string can be used. For example, 7.31E-05 (p-value), 0.33456 (mean enrichment value), “up”, “down”, etc. strand - Defines the strand - either ‘+’ or ‘-‘. thickStart - The starting position at which the feature is drawn thickly. Allowed yet ignored by BEDTools. thickEnd - The ending position at which the feature is drawn thickly. itemRgb - An RGB value of the form R,G,B (e.g. 255,0,0). blockSizes - A comma-separated list of the block sizes. blockStarts - A comma-separated list of block starts. BED3: A BED file where each feature is described by chrom, start, and end. BED4: A BED file where each feature is described by chrom, start, end, and name. BED5: A BED file where each feature is described by chrom, start, end, name, and score. BED6: A BED file where each feature is described by chrom, start, end, name, score, and strand. BED12: A BED file where each feature is described by all twelve columns listed above. We have defined a new file format (BEDPE) in order to concisely describe disjoint genome features, such as structural variations or paired-end sequence alignments. We chose to define a new format because the existing “blocked” BED format (a.k.a. BED12) does not allow inter-chromosomal feature definitions. In addition, BED12 only has one strand field, which is insufficient for paired-end sequence alignments, especially when studying structural variation. The BEDPE format is described below. The description is modified from: http://genome.ucsc.edu/FAQ/FAQformat#format1. chrom1 - The name of the chromosome on which the first end of the feature exists. start1 - The zero-based starting position of the first end of the feature on chrom1. As with BED format, the start position in each BEDPE feature is therefore interpreted to be 1 greater than the start position listed in the feature. This column is required. end1 - The one-based ending position of the first end of the feature on chrom1. The end position in each BEDPE feature is one-based. chrom2 - The name of the chromosome on which the second end of the feature exists. start2 - The zero-based starting position of the second end of the feature on chrom2. end2 - The one-based ending position of the second end of the feature on chrom2. name - Defines the name of the BEDPE feature. strand1 - Defines the strand for the first end of the feature. Either ‘+’ or ‘-‘. strand2 - Defines the strand for the second end of the feature. Either ‘+’ or ‘-‘. Any number of additional, user-defined fields - BEDTools allows one to add as many additional fields to the normal, 10-column BEDPE format as necessary. These columns are merely “passed through” pairToBed and pairToPair and are not part of any analysis. One would use these additional columns to add extra information (e.g., edit distance for each end of an alignment, or “deletion”, “inversion”, etc.) to each BEDPE feature. These additional columns are optional. The GFF format is described on the Sanger Institute’s website (http://www.sanger.ac.uk/resources/software/gff/spec.html). The GFF description below is modified from the definition at this URL. All nine columns in the GFF format description are required by BEDTools. seqname - The name of the sequence (e.g. chromosome) on which the feature exists. source - The source of this feature. This field will normally be used to indicate the program making the prediction, or if it comes from public database annotation, or is experimentally verified, etc. feature - The feature type name. Equivalent to BED’s name field. Any string can be used. For example, “exon”, etc. start - The one-based starting position of feature on seqname. BEDTools accounts for the fact the GFF uses a one-based position and BED uses a zero-based start position. end - The one-based ending position of feature on seqname. score - A score assigned to the GFF feature. Like BED format, BEDTools allows any string to be stored in this field in order to allow greater flexibility in annotation features. We note that this differs from the GFF definition in the interest of flexibility. frame - The frame of the coding sequence. Use ‘0’, ‘1’, ‘2’, or ‘.’. attribute - Taken from http://www.sanger.ac.uk/resources/software/gff/spec.html: From version 2 onwards, the attribute field must have an tag value structure following the syntax used within objects in a .ace file, flattened onto one line by semicolon separators. Tags must be standard identifiers ([A-Za-z][AZa-z0-9_]*). Free text values must be quoted with double quotes. Note: all non-printing characters in such free text value strings (e.g. newlines, tabs, control characters, etc) must be explicitly represented by their C (UNIX) style backslash-escaped representation (e.g. newlines as ‘n’, tabs as ‘t’). As in ACEDB, multiple values can follow a specific tag. The aim is to establish consistent use of particular tags, corresponding to an underlying implied ACEDB model if you want to think that way (but acedb is not required). Some of the BEDTools (e.g., genomeCoverageBed, complementBed, slopBed) need to know the size of the chromosomes for the organism for which your BED files are based. When using the UCSC Genome Browser, Ensemble, or Galaxy, you typically indicate which which species/genome build you are working. The way you do this for BEDTools is to create a “genome” file, which simply lists the names of the chromosomes (or scaffolds, etc.) and their size (in basepairs). 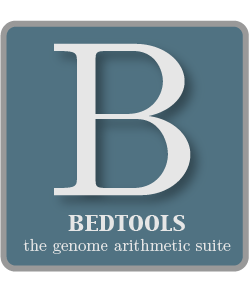 BEDTools includes pre-defined genome files for human and mouse in the /genomes directory included in the BEDTools distribution. The SAM / BAM format is a powerful and widely-used format for storing sequence alignment data (see http://samtools.sourceforge.net/ for more details). It has quickly become the standard format to which most DNA sequence alignment programs write their output. Currently, the following BEDTools support inout in BAM format: intersectBed, windowBed, coverageBed, genomeCoverageBed, pairToBed, bamToBed. Support for the BAM format in BEDTools allows one to (to name a few): compare sequence alignments to annotations, refine alignment datasets, screen for potential mutations and compute aligned sequence coverage. The details of how these tools work with BAM files are addressed in Section 5 of this manual. The Variant Call Format (VCF) was conceived as part of the 1000 Genomes Project as a standardized means to report genetic variation calls from SNP, INDEL and structural variant detection programs (see http://www.1000genomes.org/wiki/doku.php?id=1000_genomes:analysis:vcf4.0 for details). BEDTools now supports the latest version of this format (i.e, Version 4.0). As a result, BEDTools can be used to compare genetic variation calls with other genomic features.